Camping is fun … as long as I don’t have to sleep on the ground, lol. 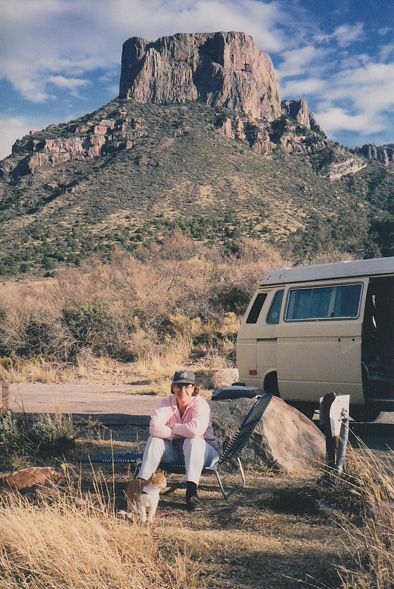 In the mid 1990s my husband and I bought a WV Westphalia pop-up Camper van and we traveled across the USA at the southern tier. We fell in love with Texas, and especially Big Bend National Park. Here we are in the Chisos campground. Yes, we brought our cat. Hiking and exploring was part of the allure, and in examining the trail brochures, one day we decided one day to hike the Window trail. We were strongly warned, very strongly, not to step too close to The Window, which is an opening in the mountains to a view over the desert. Very high up. 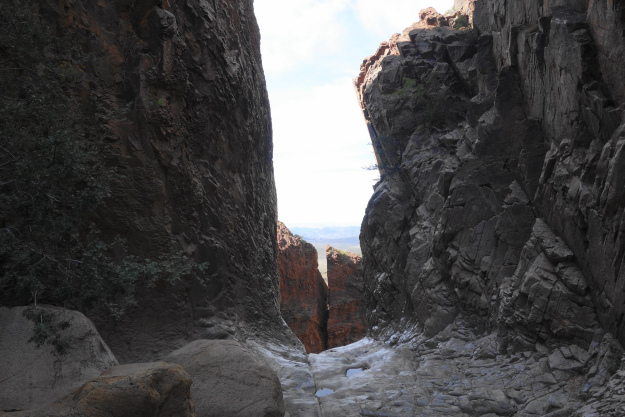 The continual water at what’s called The ‘pour-off’ had smoothed the rocks at the pour-off and it was slippierer than it looked, even in dry conditions. The drop is thousands of feet. I am a bit hesitant of heights and a scaredy cat in general, so I heeded the warnings and stayed back. My husband thought it was funny to go closer and do a dance. Ha. Ha.We were warned how fast the fall could happen, even if you’re wearing appropriate footwear. The rocks are smooth as glass, they provided no traction and no grip. It was pure luck he didn’t fall. When you’re saved, your eyes are opened and you realize there is no such thing as luck. The LORD has numbered the days of each person on earth. We are immortal until that day arrives. However, the walk is still slippery. Any Christian could fall at any time, me included. And unlike in other life experiences where the longer you go the easier it gets due to your accumulated experience, in Christian life, the longer you go the harder it gets. This is because we increasingly mourn over our and others’ sin. Or we get casual and then comes Jesus’ chastisement in order to grow us. Or we love people more and become sensitive to their burdens. There are lots of reasons why life with Jesus grows sweeter, but harder. The Bible warns of the way of the slip. He who thinks that apart from Jesus he has sure footing is likely due for a slip. These verses make it clear that our ultimate security in Christ is permanent, but our walk is fraught with temptations and dangers. Take care not to temporarily slip. He will not let your foot slip– he who watches over you will not slumber; (Psalm 121:3). I think of the dance at the edge of The Window where the pour-off was so slippery. Do we treat sin that way? Dance up to the edge of it, abusing God’s grace and tempting the devil? We have to do our part. Resist sin, follow His commands. A true Christian can never irrevocably fall from grace, but we can slip and fall into sin. Over-confidence can be an enemy. Let no one say when he is tempted, “I am being tempted by God”; for God cannot be tempted by evil, and He Himself does not tempt anyone. But each one is tempted when he is carried away and enticed by his own lust. (James 1:13-15). I was listening to Martyn Lloyd Jones yesterday. He was talking about the simplicity of the Gospel and clarity of the Gospel life. Sometimes we over-complicate things, making them out to be more opaque than they are. Life in Christ is simple, very simple. Resist sin, do not tempt it, and heed the Bible’s commands.